"What is in my bowl?" Where is the PetWay Food produced? Our food is produced in the USA at Ohio Pet Foods. This facility has been producing pet food for 28 years. We have never had a recall due to the quality of the ingredients and the testing that the product undergoes before being shipped out to be consumed by your pets. What certifications does The PetWay pet food have? The facility that produces our food has an EU Certification. The food is formulated to meet the nutritional levels established by the AAFCO dog food nutrient profiles. Our food was formulated by animal nutritionists and veterinarians to meet the nutritional needs of your pet. Also with advantages such as prebiotics and probiotics for proper assimilation, and glucosamine and ghondroitin for joint support. EU certification means that the pet food and ALL of its suppliers must meet EU standards. Animal Plant Health Inspection Services (APHIS) is a division of the USDA. 1) Manufacture pet food that is fit for human consumption. According to European requirements, this is a defining factor for quality pet food. All human grade food must meet guidelines set by the USDA and the U.S. Food and Drug Administration (FDA). By contrast, pet food without the APHIS European certification may contain by-products that are declared unfit for human consumption and have little or no nutrition. Ingredients not fit for human consumption often contain bacteria, chemical residue and carcinogens. 2) Obtain a health certificate. Pet food manufacturers must obtain a health certificate that is signed by APHIS after pet food manufacturing facilities have been inspected and officially approved by APHIS veterinary services. A health certificate must accompany each individual pet food shipment. 3) Meet labeling requirements. Pet food manufacturers who want APHIS European certification must meet strict labeling requirements that include listing all additives, preservatives, antioxidants and color. Labels must include a description of the pet food (complete or complementary) and describe the species for which it is intended (dog, cat or other animal) If the label indicates "complete," the food must be nutritionally complete for one daily serving. The label must be written in the official language of the country in which it's sold. 4) Pass quality controls. Suppliers of cereals, meat or fish must be approved by APHIS. Approval is based upon freshness, nutritional quality and digestibility. Quality control at the manufacturing site measure levels of protein and the percentage of fat. Additional quality controls cover hygiene, packaging and storage. Heat and plastic containers are our worst issues with storing our holistic foods. There are no chemical preservatives so the food needs to be cool. We store the food in an air conditioned warehouse before it arrives at your door. If using a plastic container to store PetWay holistic foods it is important to store properly. The best method is to store PetWay All Natural Pet Foods in its original bag. It is safe to set the entire bag inside your pet food container. Are the ingredients sourced from the USA? Yes. all USA meat, vegetables and fruits. The Salmon does come from the oceans of Novia Scotia. How can I tell if I am feeding too much? 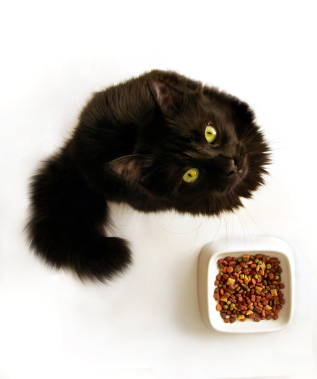 Your pet should ready to eat at mealtime. If there is hesitation, perhaps you should indeed cut back on the amount fed. A veterinarian once stated that if your dog does not act hungry, it is overfed.There should be a definite waistline behind the ribs in most breeds. If not sure, please check with your veterinarian. If your pet needs to loose a few pounds, please just cut back on the amount in the scoop. Switching to a low fat, low protein diet should be for a only a very short period of time, unless there are other issues such as pancreatitis or kidney disease. Are The PetWay treats fattening for my pet? The ingredients and guaranteed analysis are listed on most treats we list on the website. Most are low fat, so giving a healthy treat with no fillers or chemical preservatives can be guilt free! These are a few of the questions we answer on a regular basis. Please email with any questions or your own. Thanking you for your continued trust and loyalty! Just how expensive is this food compared to the food I normally buy at the grocery store? See our price comparison chart Some of our blends cost more, some the same and some even less! The real question is what kind of quality are you getting for your money? The truth is most conventional dog foods have low quality protein, harmful preservatives, and fillers that aren't good for your dogs health. The PetWay blends have only pure, natural, and organic ingredients with extra healthy ingredients added to improve your pet's health! What happens when I run out of food? Answer: Reorder is easy-Go online-once you set up an account in the shopping cart-just sign in and click "reorder" OR. Call us, E-mail. By signing up for our automatic delivery service you don't need to worry about reordering or running out, we deliver on a schedule that together, we decide on. What if I can't be home when your deliver the food? No problem! We rarely see our customers, the food is in a weather proof USDA approved bag, that is left on your front porch-put of the weather. I don't feel safe puting my credit card information on the internet, how can I still order? We have taken measures to secure our sever, but if you still aren't comfortable, just use the online shopping cart and at checkout click COD for cash on delivery and then you will not be required to enter credit card information and we will process your order. Just leave your payment at the front doof in an envelope, for us to pick up when we deliver your order. Of course you may order by phone as well. How will I know when when my delivery day is? Answer: We deliver to local cities on specific days.We are in that area once a week You can look at our Delivery Schedule under-"How it works" on our website -also in the menu of the shopping cart, we will e-mail or call with your exact delivery day as well. If I forget to call before my delivery day where can I get the PetWay food? There is a listing under-"How it works" of grooming stores that stock our products for pick-up, and also in the shopping cart under -"Delivery Schedule"
My dog or cat seems alright, why should I change his or her food? Most of the time, problems in your pet show up later in life. Feeding him properly now will be an investment for his future. Also, sometimes you don't realize your dogs potential for great health until you see it! My dog got sick when he ate The PetWay's food. Most likely you have been feeding your dog the same food for a long time. A sudden change may make him sick! We suggest you gradually introduce the food by mixing it with his old food. We have had several customers tell us their dogs actually picked their old food out from The PetWay's food and spit it on the floor! My dog won't eat The PetWay's food! Most dogs love the taste of our blends. However, some dogs have a preference for softer foods. Try mixing the food with some warm water to release the smell and soften the kibbles a bit.